Hope's Cafe: Beecolgy Beecentric Body Care-Review and Giveaway! Beecolgy Beecentric Body Care-Review and Giveaway! 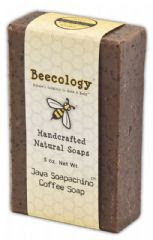 Beecology is a fun company that offers all natural hair and body care products- all influenced by...you guessed it... bees! "About four years ago a co-worker of mine asked if he could put a beehive at my family farm. I said yes, thinking I would bear no responsibility, but (here it comes) after two weeks his wife became pregnant and he told me he couldn't tend to them. I was a beekeeper by default. At first I couldn't believe I would be taking care of bees, but I soon became fascinated with bee culture and science. I started to learn about bees and attended workshops at The Ohio State University agricultural campus. Beyond enjoying the science of bees, just the act of tending to bees gave me time to reflect. It became a very cathartic activity. And I started to realize that the world of bees imitated our life on earth. The tiniest changes in the environment are reflected in the bees' environment, which led me to think about the foods we eat and the chemicals we use and the impact these outside factors have on bees and on us. These small revelations made me want to make products from bees that are better for us than what our mothers and fathers have been using. Products as natural as I can make them without sacrificing quality and the safety of our customers. From that came the idea of "Beecology" and its charitable arm, SweetYear.org." The coffee grounds also work as a natural exfoliant, so it's like a 2-in-1! I love using this after chopping onion...gets rid of the smell immediately! I also received the Buzz Balm "Super Sting" Peppermint Lip Balm. This lip balm contains tea tree oil and peppermint oil, and definitely gives your lips a buzz! I usually apply a little lip balm right before bed, and this is the only one I've ever used that lasts through the night. Usually by morning you can't tell there was any lip balm, but this one I can still feel when I wake up. I love it! Then, I tried the Honey and Botanical Shampoo. This is a sulfate-free shampoo, and not until reading the info on Beecology did I realize how important that was! I never even realized that Sodium Lauryl Sulfate (found in many shampoos you buy in the store), is actually used in clinical trials as a skin irritant! This shampoo, however, provides a gentle yet deep cleansing. It turns into a rich, thick lather that really nourishes the hair. It is loaded with botanicals that are proven to replenish hair, such as nettle and chammomile, and also has honey and wheat protein! I love using this luscious shampoo! Then, of course, to finish out the hair care routine, I received the All Natural Conditioner. This is one of the richest conditioners I have ever used. With ingredients like premium propolis extract (from beehives), honey, avocado, and hemp oils, this conditioner nourishes, strengthens, and moisturizes the hair. After using this for several days I could see a difference in the volume, softness and shine of my hair. It works great! I also love the lovely honey scent that lingers even after rinsing. My hair smells like sweet honey all day now! Beecology is giving a Shampoo and Conditioner to one of my readers!! Go to Beecology and tell me which product you'd like to try! Disclaimer:I received product for the purpose of review. All thoughts and opinions are mine. All quotes taken from the Beecology website. I've been dying to try these products, especially the Honey & Botanical Sulfate-Free Shampoo. I'd like to try their Natural Honey. I would love to try the original hand and body cream. I follow you on GFC (Jennifer Mo) 2/2. I follow you on Twitter @noteasy2begreen. I'm a lip gloss junkie so I would want to try the "Buzz Balm "Super Sting" Peppermint Lip Balm" it sounds really refreshing and strong, which is what I like. Original Honey Hand & Body Cream would be my choice. I would like to try All Natural Grapefruit & Lemongrass Body Wash.
Natural body care products, on the other hand, provide a far safer and effective alternative. Not only do they not cause any harm associated with chemical products, they actually enhance the beauty of our skin and hair naturally and effectively. And contrary to popular myths, natural products also have great short term results. You will never need to compromise on how good you look today in order to preserve your skin and hair for a later time. I would try the Buzz Balm 'Super Sting" Peppermint Lip Balm. i'd love to try the Honey & Botanical Sulfate-Free Shampoo. I'd like to try the buzz balm!